It is not that I woke up late this morning, as I did not. I just really enjoy the sound of rain falling in the morning, while I’m covered in layers of blankets. Of course, enjoying this small thing, laying in bed listening to the rain, cost me time. Time that I would usually use to make my breakfast. And then it happened. I opened Twitter and was reminded that Taco Bell started serving breakfast this morning. “Well that settles things,” I said to myself non-verbally. After showering and getting dressed for work, I posted an update on Twitter and left my apartment for the Taco Bell across the street. About to stop in Taco Bell and try the breakfast menu. Will update soon. 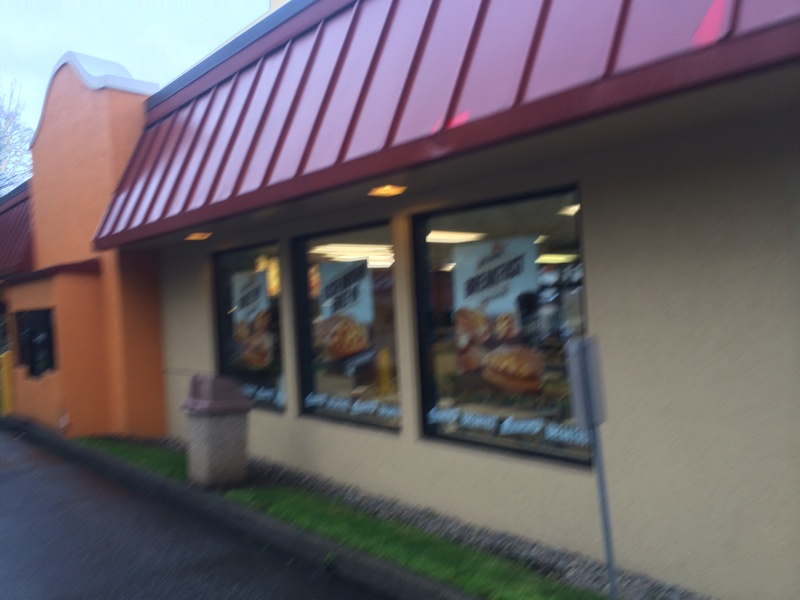 Taco Bell was wrapped in advertising pictures for their new products – my apologies for the blur, I was walking and slightly rushed when I took this picture. Attendant at the counter after giving me their new welcome line: "aren't these new greetings super awkward?" This is the current menu – looks like they switch them out at lunch time, maybe? Chatted with the manager. He said during training, staff had to try all the breakfast items. The manager said his favorite is the AM crunchwrap. This tweet is evidence that holding a Taco Bell bag, eating, and posting updates to Twitter at the same time is… deeply flawed. 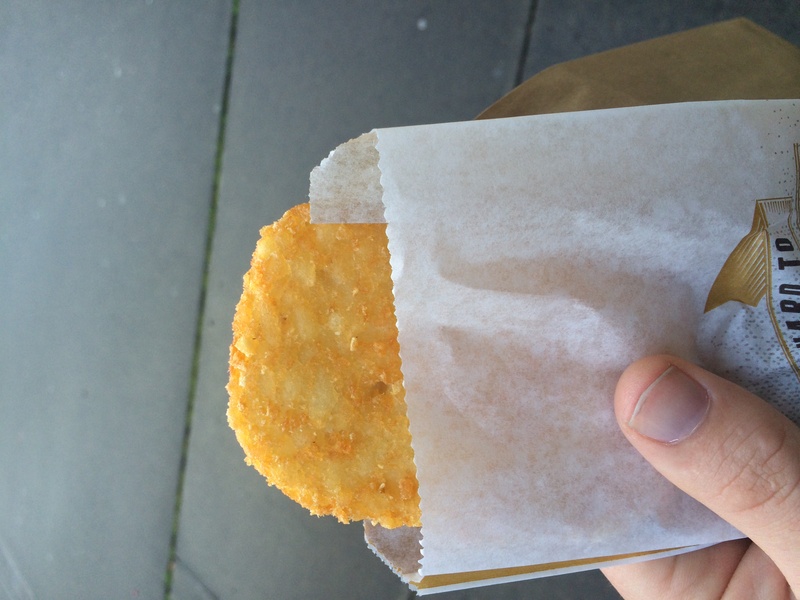 I ate the hashbrown on my way into my office. It was alright. Tasted like grease and potato. Not as sweet as McDonalds, but not really what I want in a hashbrown. I waited until I got into my office and had a chance to sit down before starting the waffle taco. I pulled it out of the plain brown paper bag Taco Bell gave me and set it on the desk for photographs before eating it. 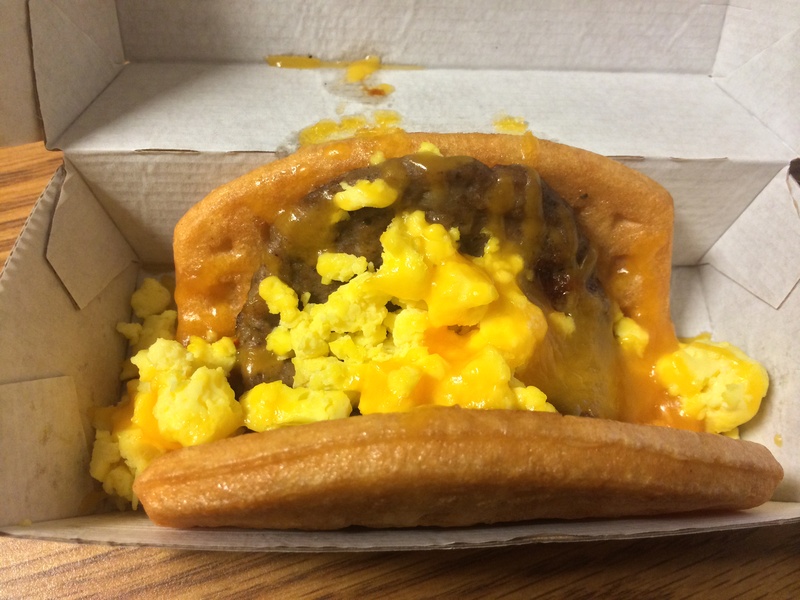 The overall experience of the Waffle Taco is not one I am likely to repeat. I really loved that waffle – they would make Leslie Knope proud by being just crispy enough on the outside and perfectly chewy on the inside., but the sausage tasted like it was not better than cafeteria sausage. The eggs were kinda bland and just existed as filling. The cheese didn’t really matter much at all. The syrup added to the overall flavor and experience more than not. Maybe next time I will get the waffle tacos without the filling. Just Taco Bell waffles. Will I go back for other breakfast items? It is entirely likely, but probably not on days that I have to be at work. 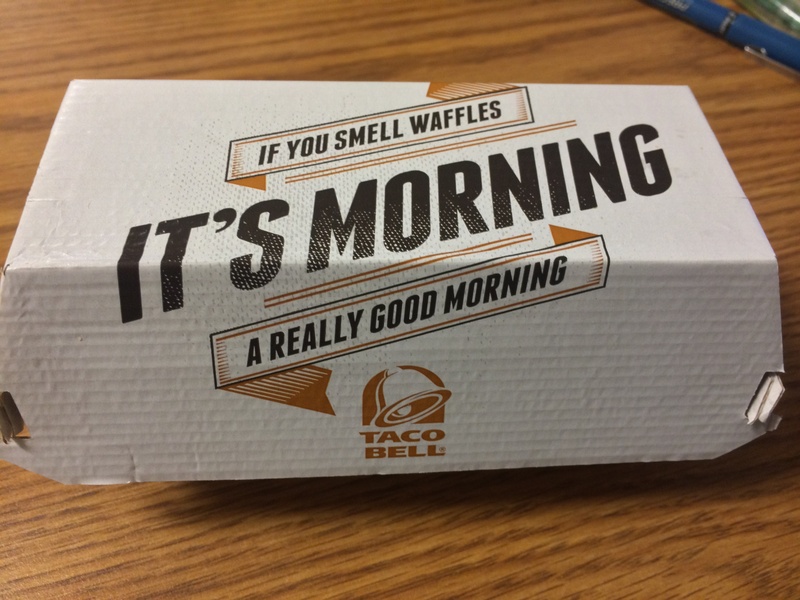 This entry was posted on March 27, 2014 by Nathanial in Uncategorized and tagged Taco Bell, Waffle, Waffle Taco.